Celebrating twenty-one years in practice, KC+A architects are looking for a talented Project Architect to join the team. With a competitive salary package and ample opportunity for advancement, we are looking for a candidate to engage in an exciting range of design-led projects in London & the South-East. KC+A are committed to designing better spaces for people to live, work and play in, through the integration of sensitive consultation, design quality and efficient use of resources. With projects ranging from £5M to £40M, including schemes in private/social housing, heritage, urban design and mixed-use facilities, we aim to design buildings which enhance the quality of life for the inhabitants and visitors of London and South-East. RIBA Chartered Member with a minimum of 3+ years’ post Part III qualification experience in delivering medium/large scale projects. Experience of delivering affordable & private housing led schemes in London & the south east. Knowledge of the GLA & HCA housing design & funding standards. Experience of Build to Rent and/or Later Living schemes an advantage. Experience in planning work stages 0-3 and post planning delivery stages 4 -7. Detailed knowledge and experience of UK Building Regulations. Exceptional design & problem-solving skills. Enthusiasm and a desire to learn. The ability to work effectively as part of an in house team. Experience in managing work flows. Excellent communication skills with fluent spoken and written English. 4. Proof of the right to work in the U.K.
KC+A architects is an equal opportunities employer, governed by our comprehensive in-house policy. We value the creative potential which individuals from diverse backgrounds and with differing skills and abilities. We hope you like our brand refresh & new website. After 21 years our mission remains as strong as ever and our ambition is to continue creating better places for people to live, work and play for the next 21 years and more. To recognise the contribution of our growing team of talented architects & designers, who share this vision, we are updating our name to KC+A (Kiran Curtis + Associates). We are excited about the future, let’s work together to design a brighter one. We are delighted to present you with our brand-new website. Over our 21 years in the industry our focus has always been on designing commercially successful, mid-size developments that create brighter futures. We continue to do this by integrating sensitive consultation, design quality and efficient use of resources. We hope you like the new design which showcases our projects & will keep you up to date with what is happening at KC+A. This year we are taking part in the annual Museum of Architecture Gingerbread City exhibition running at the V&A Museum from 8th December until 6th January. The exhibition features an entire city of structures made completely out of gingerbread, with projects created by different architects, designers and engineers. This year’s theme of ‘Imagining the Future City” inspired us to create ‘Peppermint Perch’, a healthy environment for students to flourish and grow, provided of course they refrain from nibbling the cookie walls or licking the marzipan plants! The scheme hosts a shared community of residents which is made up by a series of indoor and outdoor spaces. These include active social spaces such as the café, games room, outdoor gym and growers garden. There are also quiet study pods and pocket contemplation gardens where scholars can retreat and recharge. Hanging gardens are an integral part of the scheme providing clean air and stress relief to busy Gingerbread City dwellers. 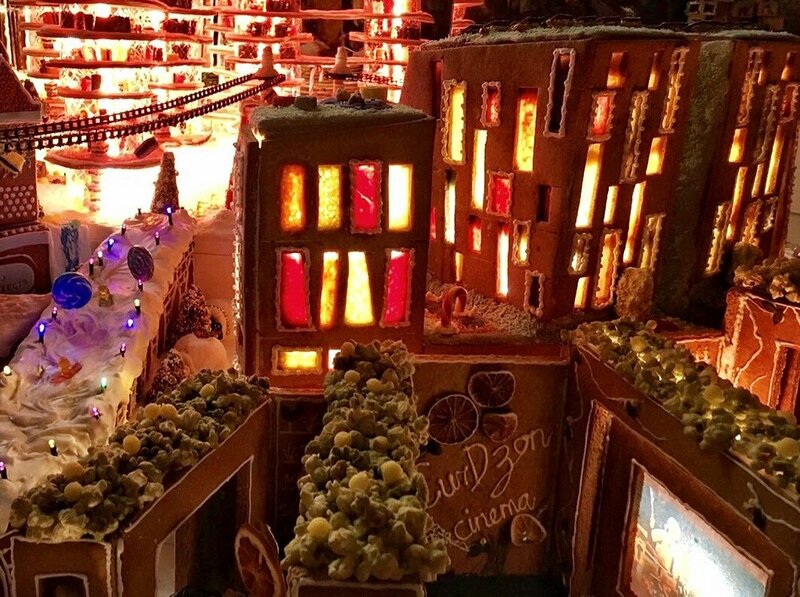 The Gingerbread City exhibition has already been featured in several publications such as The Daily Telegraph, Business Recorder, The Business Times, as well as some international outlets KTVQ, The Daily Star Lebanon, WPXI. Book your ticket and see you there! Our offices will be closed on the 25th December and will re-open on the 4th January.